fitness equipment: VITO Sprint 20 Treadmill – you just gotta have it! VITO Sprint 20 Treadmill – you just gotta have it! The treadmill was invented almost 200 years ago. Born out of necessity, it was originally invented to tap into animal power to directionally run water pumps, spinning wheels and butter churning. Moreover, treadmills were used in the production line of factories owing to its conveyance characteristics. One renowned application was in the early Ford Motor Company automobile plant. However, sometime around the mid-1890s the treadmill was introduced to health clinics as exercise equipment. Alluringly and as a testament to its invaluable contribution, NASA introduced and installed the treadmill on board the space station in 2000. This was purposefully for astronauts to use it to keep themselves fit in zero gravity conditions. Since its creation, treadmills have come a long way and today, they can be found, among other places, in physiotherapy centres, gyms, sports clubs, orthopedic shoe shops, Olympic training centres, fire, police & army training centres, homes, offices and hospitals. Hence, Trend Masters is proud to add the VITO Sprint 20Treadmill as the latest addition to its range of exercise equipment. Made of outstanding quality materials and smartly designed and crafted, it’s an exercise equipment you can trust. The generous running surface is 122cm x 44cm. Equipped with easy one-push set-up, there is the added feature of a red Emergency Key for enhanced safety. Weighing in at slightly over 80kg, the sturdy and steady VITO Sprint 20 Treadmill supports body weights of up to 120kg. Its high-quality finishing is aesthetically pleasing to the eyes. With a 2-Hp. Motor, it delivers smooth power while the inclines of 0-15% gradient simulating uphill walk, jog or run offers good workouts for your calf, thighs, buttocks and hips. Quick control buttons at the handle bar provide ease and convenience. The piece de resistance however, is the built-in training computer. This is the nerve centre of the VITO Sprint 20 Treadmill. With the 6-window LED displays and 8 functions, it serves as a good motivator and adds pleasure to your workouts. The VITO Sprint 20 Treadmill is excellent for doing cardiovascular exercises and weight loss or slimming programmes - leading to toning of the tummy, hips and thighs. Having it in your home provides flexibility to time and frequency of workouts. Speed and intensity are important factors but monitor your heart rate. Begin with a warm up and gradually increase your pace. Start with a walk onto a slow jog and a run. Taper down before you end your workouts. You could tone your muscles and improve your endurance and stamina. 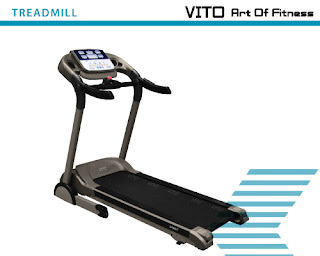 It’s a great way to keep fit and healthy with VITO Sprint 20 Treadmill. Get it today and be on the road to good health. Exercise Equipment & Fitness Equipment Super Store with savings up to 50% off everyday low prices for quality home exercise equipment and fitness equipment.